CELEBRATION, Fla. - A damaged apartment complex in Celebration has been deemed unsafe, officials said Monday. Multiple units at the Sola at Celebration apartments, which are two years old, are cracking at 1662 Celebration Boulevard. During a recent repair project, crews noticed that the damage was much more extensive then they first thought. "They invested in a complex that's basically sinking and now they're trying to recoup their losses," said resident Steven Kapusta, who has lived in his apartment a year and a half. 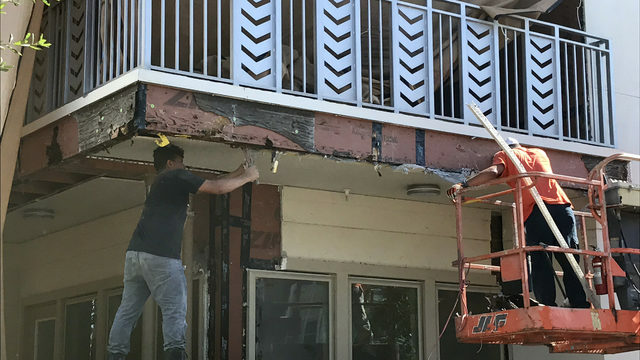 Architecture and Engineering found "extreme deterioration" of the "wood structural members" and cited "questionable construction methods" in the buildings. The Osceola County building inspector has issued a “yellow tag” on the property, which means residents can only stay there for the next 30 days, and only at their own risk. Southstar Management I, LLC, who oversees the property told about 200 residents in a letter that residents should begin searching for a new home immediately and that residents will receive a security deposit refund and August rent refund. Residents have 30 days to leave. I like the Edgewater Drive design. Traffic circles can get confusing. Do you mean a "travel lane" diet? What do you mean by more "progressive"? Do you mean more "drastic"? Or do you mean more alternative to car friendly? Because both plans call for bike lanes, no? Traffic circles may be confusing to some but their benefits are well documented. I mean road diet - a commonly used phrase. "Progressive" approaches to reclaiming our cities - another commonly used term. thanks for responding, but I still don't get it. I've heard the term "progressive" used in many different contexts (political), but I don't know from an urban planning and civil engineering standpoint how that term applies to intersection design. Anyway, are you for the traffic circle plan or against it? It doesn't really matter to me either way. My read was that in the Edgewater plan, they take out a travel lane, and in the traffic circle plan, they do just that, and leave all travel lanes intact. I'm not sure which plan would benefit the businesses and walkability more. But I think they said the business owners preferred the traffic circle plan? Progressive is not merely a term to describe liberal bias. In this example I was simply stating that a progressive approach (a plan based on gradual improvements over stages) was on the table and was unpopular among business owners because of short term disruptions to their properties. The more "progressive" approach would have essentially turned Broadway into another Plant Street (Winter Garden). Instead, it will remain a highway for the foreseeable future. The traffic circle is present in all the options presented to the city commissioner. I am absolutely for traffic circles as they slow down traffic and prevent head on collusions. Like I already stated, the benefits to traffic circles are well documented and it's hardly disputed. Downtown Orlando initially fell prey as well until the 1980's streetscape put that portion of Orange Ave on a road diet. It's probably not accidental that Orange languished for a long time north of Robinson where the road was left with so many lanes. Edgewater Drive in College Park was widened to 4 lanes but it was relatively narrow and was able to overcome the challenge until it got its own road diet. DeLand managed to succeed with US 17-92 cutting through but the core of Woodland Ave again narrowed to keep pedestrians feeling as if they belonged there. All in all, it seems to help a lot if pedestrians aren't overwhelmed by acres of asphalt in order for these neighborhoods and Main Streets to be most successful. Surely it's not a "one size fits all" solution. The roundabouts, for instance, on Hwy 128 north of Boston are a less diserable alternative to highway ramps. I would be in favor of their removal. I went to a website called "Progressive City" based on a Google search of your phrase "progressive approaches to reclaiming our cities" from your post. It didn't talk about a progressive approach to redoing roadways. Instead, it directed me to a host article responding to Peter Marcuse who is discussing "progressive" vs "good" planning. They go through several issues dealing with different housing types, their placement, socioeconomics, etc. He goes as far as to say that in acknowledging that all land uses are matters of public interest, that this opens the door to a demand for the full socialization of land. They also talk about an "enlightened" position on the universal right to housing. He talks about public control of land also but at the same time says this would allow for a true democratic process for planning. He also states that "good planning" is "progressive planning", and "progressive planning" seeks to push "liberals" farther to the left without scaring them away. I agree that a Plant Street approach would be good. But I also agree with Aent's comment about multiple lanes being problematic. Apopka's Main Street has improved noticeably over the years since I first visited in 1999. The corridor still could use a mini-diet: keep the 5-lane configuration but narrow the lanes from 11 feet down to 10. Colonial Drive through Downtown for example has 10 foot lanes and works just fine. Anyways that should give about 2.5 extra feet to each sidewalk, possibly making them wide enough to add street trees. They could also replace the diagonal yellow stripes in the center turn lane with a median and trees - it's been done in a few areas there but could be expanded. Just my two cents. I agree with the above comment about it not being a one size fits all solution. That said, one of the main safety problems with roundabouts in America is the lack of them. It's a self-solving problem for the most part. If more people used roundabouts, the unfamiliarity that causes safety issues would go away. It's a chicken/egg problem, though. A few cities have a lot of them now, and have for several years. In multilane roundabouts, even with years of experience, many people just cannot seem to understand which lane they are supposed to be in to make a left. And thats a pretty severe mistake. Some quick candid pictures from Kissimmee. In the foreground of the first photo is the garage for Toho Flats and you can sort of see the Sunrail ^ shaped canipies in the background by the existing Amtrak platforms. I'm rooting for this project - I'm also worried it's a bit of a block buster. Looking forward to seeing how the apartments soften the presence of the garage. i cannot say I've seen it in nearly 10 months so your updates are much appreciated! Having driven around Eola/Delaney/Wadeview for years now, I want to maim every single driver. STILL no one knows how to use them and they've been there forever. As someone who uses one almost every day with some of the same results, I understand. There are just so few of them here. Ever used one of those on a bike? There's a lot of well, I'm about to die thoughts going through my head riding there. Progress on the Kissimmee SunRail station. In the background is the recently completed station parking garage. In the foreground (Not pictured) is the recently completed Lynx central bus station. This brings Lynx, Amtrak, Greyhound, and SunRail all to a single intermodal station in DTK. Osceola County, which has become quite innovative in transforming a sleepy cattle area to a motel and strip mall poster child for sprawl and more lately to a live/work/play demonstration of urbanist principles, is considering a six-month moratorium on development to decide how to move forward. This has the potential to ba almost as big for Osceola as all the electoral changes coming in 2018 for big brother Orange County. Once again, stay Tuned. Orlando Health has just announced that they will be building a satellite center at Tupperware SunRail Station on Osceola Parkway. This will be a transit oriented development. Speaking of Sunrail, progress on the downtown Kissimmee station. I read that...late... anyway, i get that they don't want to be a bedroom commu ity for Orlando still, but, they need to understand that they need to up their population to attract more businesses, like office parks, etc. And i don't think the Lake Nona people are building in Osceola bc they want to get into the affordable housing business either. Was able to spend a few hours in downtown Kissimmee today. Kissimmee City Centre condos in the background.